Posted April 7, 2016, in News. 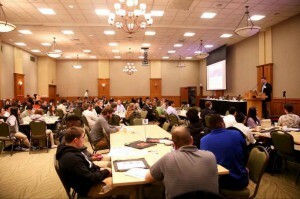 On March 24, 2016, the Senator Walter Rand Institute for Public Affairs, Rutgers University–Camden, in conjunction with the Institute for Effective Education and the Rutgers University Camden Office of Civic Engagement, convened students from high schools across the state, as well as local government officials, to explore current and potential methods of involving youth in government decision making at the municipal level in an effort to increase lifelong civic engagement. Over 130 individuals attended the event, representing municipalities from across the state, including Bernards Township, Sussex, Pine Hill, Bridgeton, Salem, Palmyra, Burlington, North Bergen, and Bloomfield. How does/can involving youth in local government impact our community, our youth, and the future of voter participation? 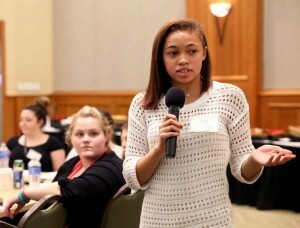 What are some of the experiences of youth in New Jersey participating in local government? How might we help communities better involve youth civically in their home towns? Gwendolyn L. Harris, Executive Director of the Senator Walter Rand Institute for Public Affairs at Rutgers University–Camden, was the moderator for the symposium. The event began with opening remarks from Kris Lindenmeyer, Dean of the Faculty of Arts and Sciences & the Graduate School at Rutgers University–Camden. Dr. Lindemeyer welcomed the students and municipal leaders and spoke of Rutgers University-Camden’s long tradition of civic engagement. The first panel discussion was directed at why youth should be involved in local government decision making. Albert Kelly, Mayor of Bridgeton, started off by discussing current voter participation in New Jersey’s general election. Mayor Kelly believes that, if youth were more civically engaged, then there would be a higher voter turnout in the general election. Daniel Hart, Distinguished Professor of Psychology at Rutgers University–Camden, then discussed the developmental readiness of youth in local government decision making. His primary reasons for the argument were that youth are ready and optimistic, open to different political perspectives, understanding of their communities, and can be recruited into civic action, such as volunteering and social movements. John Wall, Professor of Philosophy and Religion, as well as Childhood Studies, at Rutgers University–Camden, then spoke on why youth should have the right to vote. Dr. Wall shared his experiences abroad with youth rights, explaining that the voting age is now 16 in at least 20 countries and thousands of cities. Additionally, at least 30 countries have children’s parliaments for 5-to-17-year-olds. Dr. Wall presented the case that the younger that people start to vote, the more politically engaged they will be throughout their lives. , Education, and Families at the National League of Cities, presented on authentic youth civic engagement. Ms. Furr identified factors that limit authentic youth civic engagement, such as youth believing that their voice would not be heard, a general lack of parental support, and activities being held at inconvenient times. She then selected several youth from the audience to discuss factors that would prohibit youth from participating in adult-structured civic engagement activities, and wrapped up her presentation by identifying factors that support authentic youth civic engagement. Following Ms. Furr’s presentation, a panel discussed different ways that youth could be involved in local government decision making in New Jersey. The panel discussion opened up with Bob Atkins, Associate Professor of Nursing and Childhood Studies, Rutgers University, speaking about engaging youth to build a culture of health in New Jersey. Dr. Atkins wanted the audience to view health as more than just illness and injury, but instead view it also as their overall community. Next to the podium was Taviaus Wilson, a junior at Bridgeton High School, who spoke about his experience with the Cumberland County Youth Coalition and how they convene together to discuss issues within his community; he primarily focused on issues surrounding education. The third panelist Keri Giannotti, a teacher at Bloomfield High School, spoke about Bloomfield’s Youth in Government Day. The students spend the day touring and networking with individuals from the Municipal Center, Municipal Courtroom, Board of Education, Police Department, Health and Human Services Department, Engineering Department, and Fire Department. Many of the township employees are alumni from the high school, and they share their own experiences from participating in Youth in Government Day. The day is wrapped up with a Mock Town Council meeting where students debate current issues that affect the citizens of Bloomfield. During lunch, the attendees worked together within their respective communities to complete activities facilitated by the Rutgers University-Camden Civic Scholars. The activities helped the attendees visualize their communities’ strengths and weaknesses in regards to authentic youth civic engagement. The discussion groups helped the communities to identify different strategies to engage youth in public policy, planning, and decision making. The symposium was concluded with a speech by Tom Kerr-Vanderslice, Director of National Advocacy for Generation Citizen. Mr. Kerr-Vanderslice told the group about Generation Citizen’s civics education program, where students select an everyday issue and research that issue, focusing on what their local government and community can do to better address the problem. By allowing students to work through the process, the action-civics model teaches students the role that government and laws play in their daily lives. Mr. Kerr-Vanderslice encouraged the audience to invest in civic education in schools. He instructed the audience to contact their respective local elected officials and inform them of their desire to be civically engaged. The Senator Walter Rand Institute for Public Affairs, Rutgers University–Camden, would like to thank all of the presenters as well as the attendees for making this event happen. Page last updated by Senator Walter Rand Institute for Public Affairs at 1:12 pm September 29, 2016 . This page was printed from http://rand.camden.rutgers.edu/2016/04/07/involving-youth-in-local-government-decision-making-symposium/ at 4:06 PM Monday, April 22, 2019.